Construction workers are regularly required to work in precarious situations where they put their bodies through significant strain and use powerful machinery such as jackhammers, blowtorches, saws, drills, etc.. They climb great heights, handle potentially harmful debris, work with electrical wiring, dig trenches, mix and pour concrete, and handle traffic as they build up and repair our community. It isn’t uncommon for construction workers to carry out their work in extreme weather, either. With all of this required of them, it isn’t surprising that the Bureau of Labor Statistics (BLS) tells us that the construction industry regularly tops the list of Fatal Occupational Injuries (CFOI). Injuries in construction are not to be taken lightly. 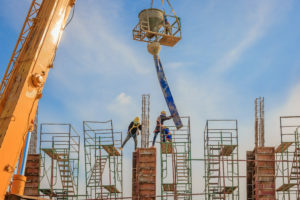 The Occupational Safety and Health Administration (OSHA) reports that “one in five worker deaths last year were in construction.” Proper safety procedures are crucial in nearly every aspect of the job, not just for the individual worker, but also to prevent endangering those that work with and around them. Regardless of how attentive an individual is to safety, injuries still occur. Federal law requires all private sector employees to report all work-related fatalities within eight hours to OSHA, and in the case of an injury that resulted in hospitalization, amputations, or loss of an eye, employers must contact OSHA within 24 hours. The rules are different for those working in the public sector, and every state requires some form of workers compensation. You will find the more information about construction injuries and STATE state laws below. Any of these injuries will incur a significant amount in medical bills, and some will further impact one’s life by making it difficult for them to perform normal everyday actions. Furthermore, debilitating injuries like these can severely limit one’s ability to work, if they are able to work at all. With piling medical bills and an inability to return to the hard labor required in construction, the disabled individual needs support and guidance to help them reassemble a manageable life. If you or a loved one has been injured while working construction, it is time to ask the lawyers.